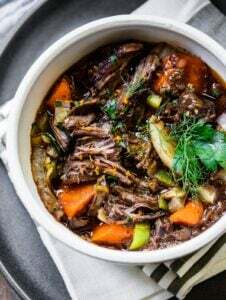 A rich French-style beef stew with red wine and vegetables. You'll love the intense flavor and it's so easy to make in a Dutch oven - low and slow! Serve this stew with wide egg noodles or simply with crusty bread and a salad. Heat oven to 350 degrees with the rack in the center. Trim the beef of excess fat and and slice into 3-inch chunks. Season the beef evenly with 2 teaspoons salt. Heat the oil in a large Dutch oven or heavy casserole over medium-high heat. Sear the beef in batches until browned. Remove to a platter. Lower the heat to medium and add the shallot to the pot. Cook 5 minutes, stirring every now and then, until it's softened. Return the beef to the pot and sprinkle with flour. Stir in the tomato paste, garlic, wine, 1 teaspoon salt and 15 turns of the pepper mill. Bring to a simmer, then add enough broth to just cover the beef. Toss in the herb bundle. Cover the pot with a sheet of parchment or foil, then top with the pot lid. Place in the oven to braise for 2 1/2 – 3 hours. The cooking liquid will be slightly reduced and the meat should fall apart when prodded with a fork. Put the carrots, leeks and fennel in a large skillet with 1/4 cup water, 1 tablespoon extra-virgin olive oil and 1/2 teaspoon salt. Place over high heat until the water boils. Cover and lower heat to a simmer. Cook until the vegetables are tender but still colorful, about 10 minutes. Just before serving, stir the vegetables into the stew. Taste for seasoning Sprinkle with parsley and about a teaspoon fresh orange zest. Serve over wide egg noodles, parmesan polenta or with crusty bread alongside. Use a 4 1/2 - 6 quart capacity pot. When reheating, add a bit more stock or water to the stew as the sauce will thicken when refrigerated.